When we last left the Four Seasons 2017 Mazda CX-5, I was trying to get a close look at Tesla’s Gigafactory in greater Sparks, Nevada. Elon Musk’s battery factory is a few miles from Tire Rack’s Western warehouse—where I had winters installed on the SUV—which sits in a sprawling new-ish office and light-industrial park. The Gigafactory, which sits low in a mountainous valley, has apparently spawned its own industrial and warehouse park, but it’s just far enough away from everything so as to make you stand out if you try to take photos of it without driving up to the security gate, which is on its own long, two-lane road. There wasn’t much to see without a high-powered telescope—there was no sign of Musk sitting on the factory floor supervising production—so I was off quickly, heading east-by-northeast toward Jackson Hole, Wyoming for the Nissan 370zki and Snow Patrol drive. I had to be back in Metro Detroit in five days, including two days with Nissan, in order to get ready for the 2018 Chicago Auto Show. 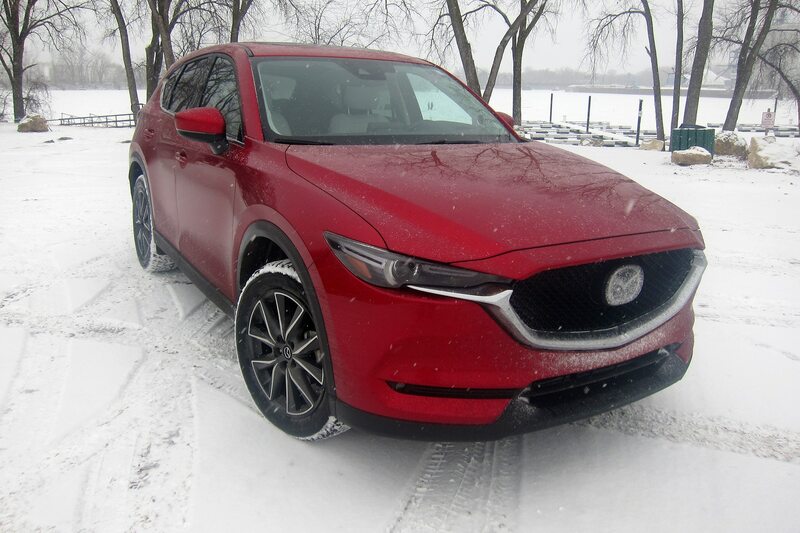 The CX-5’s brand-new Bridgestone Blizzaks felt a bit squirmy as temperatures rose well above the 40-degrees cutoff point for winter tires. It was in the 60s by the time I reached my next gasoline stop in Lovelock, Nevada, about 90 miles away from Sparks. 312 miles later, I filled up again in the optimistic-sounding little town of Jackpot, which sits on the Idaho border. Temperatures plummeted as the altitude increased. After another 194 miles, I reached that evening’s destination, the quaint mountain town of Lava Hot Springs, Idaho, which sits 35 miles southeast of Pocatello—and close enough to the Wyoming border that I’d be in Jackson Hole by early afternoon the next day. This is where it got snowy. 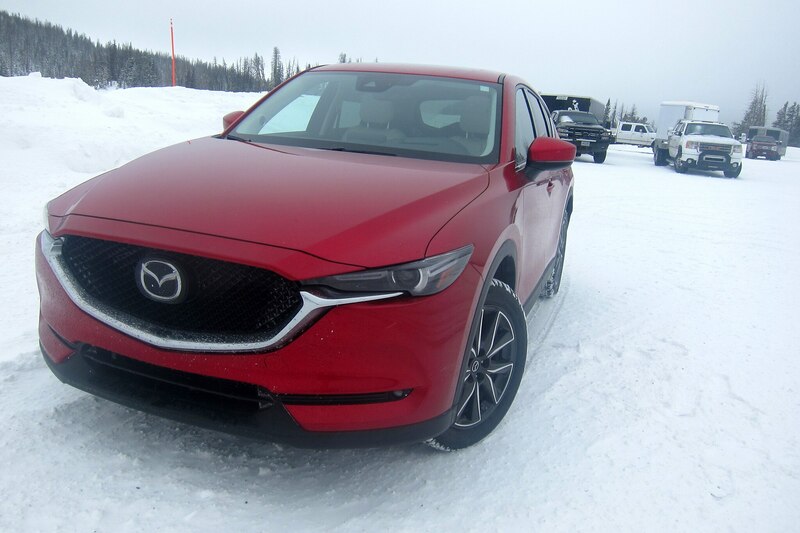 Coming into town and then on the Friday drive from Jackson Hole on snow-packed mountain roads, the only comment that I was able to make of the CX-5 is that the driving itself was thoroughly unremarkable. 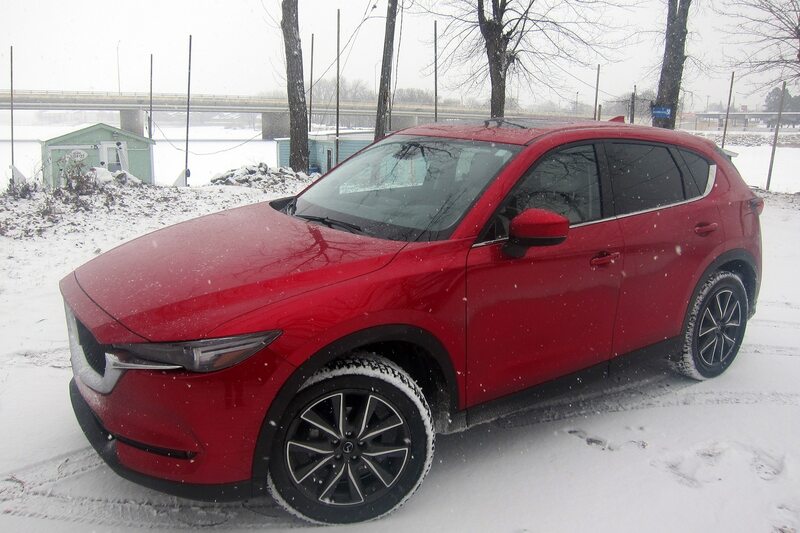 The scenery was something else, but if the Predictive i-Active AWD found itself performing any difficult or unusual tasks in keeping the CX-5 upright and on the road, none of it was communicated to me. Through long, wide Wyoming, my back and backside started to communicate to me that the driver’s seat isn’t all that comfortable for long-distance trips and I found myself shifting around a bit. It’s not bad, having gotten me this far without complaint, but after a while it seemed the lower cushion could use more support. 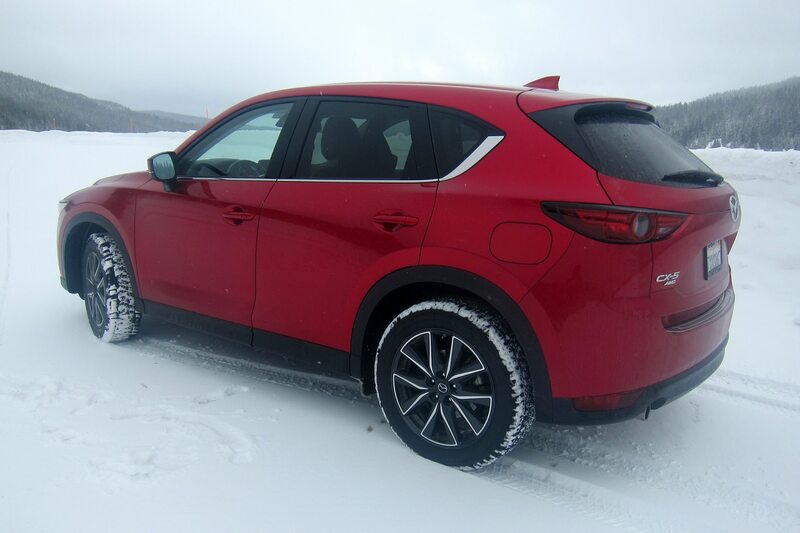 The CX-5’s steering makes up for this with its precision and relative quickness. It’s quick, but not too quick for a high-profile, high center-of-gravity SUV. The steering requires no excessive mid-turn or straight-line corrections, and it offers up a decent bit of feel and feedback. In Burris, Wyoming, temps were in the low 50s, so I pulled over on a lonesome stretch of two-lane to take off my jacket. High winds whipped the driver’s door open and nearly took it off. Seriously—I had to drive forward a few feet just to close it, again. Hope I didn’t lose any receipts. Later, I passed what I didn’t realize, at the time, was my last chance for gas. The dashboard computer still showed 90 miles of range, and this is an oil producing state, isn’t it? Neither of the two small towns between there to Casper had refueling stations. No Tesla Superchargers, either, as far as I could see. 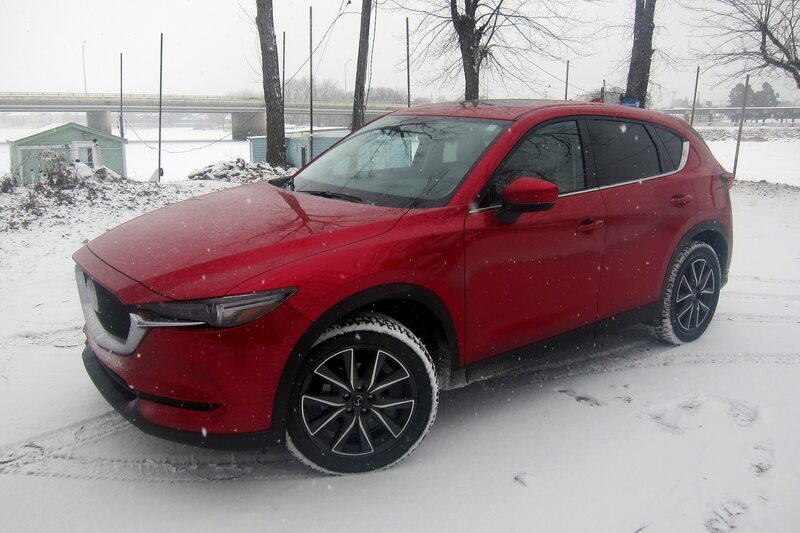 The last of these two towns was Powder Creek, and from there on I hypermiled the Mazda CX-5 best as I could. Range fell to zero about five miles west of Casper as I drove slightly uphill into a headwind. I somehow made it to a Conoco station on the edge of town and pumped 13.617 gallons of regular unleaded. 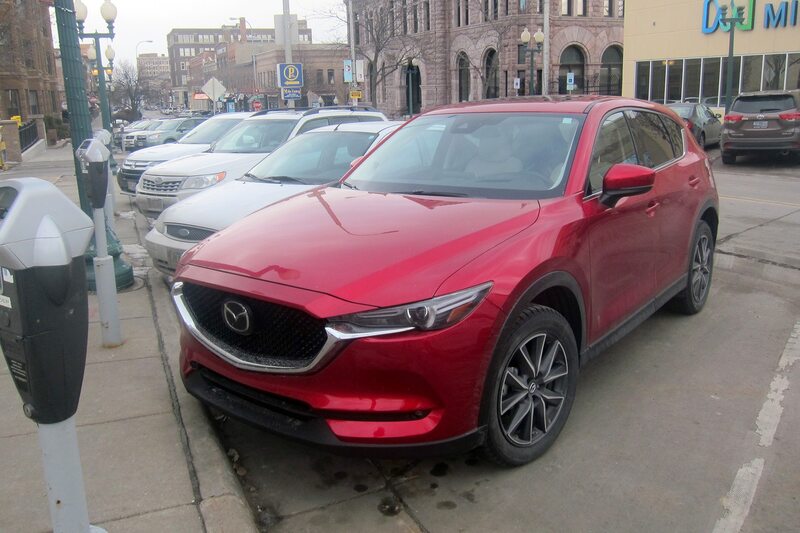 The CX-5’s owner’s manual says fuel tank capacity is 15.3 gallons (14.8 for the front-drive version), so this Mazda clearly has an American brand-style fuel gauge that trades letting you run dry for pessimism and alarm. As for my “hypermiling,” it turned out to be more than hype, though the 28.8 mpg I recorded from the fillup in Idaho Falls to Casper was only third best, behind the 29.1 mpg from Casper to Wasta, South Dakota, and the 29.4 mpg I recorded from Big Pine, California, to Lovelock, Nevada. Decent numbers, overall. Overall trip fuel mileage was 23.6 mpg, dragged down by weather I would soon encounter in the Great Lakes region. After an overnight and breakfast in Sioux Falls (I highly recommend Josiah’s Coffeehouse and Café in a revitalizing downtown), I crossed the southern edge of Minnesota, along the Iowa border, and into LaCrosse, Wisconsin, where the Glory Days Sports Pub served up a Johnsonville brat for lunch. Gotta watch the diet while on the road, you know. Somewhere between Onalaska and Sparta, late afternoon, the snow began to fly. And I mean fly. This was the storm of the season, and it followed me all evening to New Berlin, just west of Milwaukee, with snow and ice and poor visibility that slowed me to 35-40 mph on Eastbound I-94. The storm met up with me the next day and accompanied me all the way along I-94 from Lake Michigan to Metro Detroit. 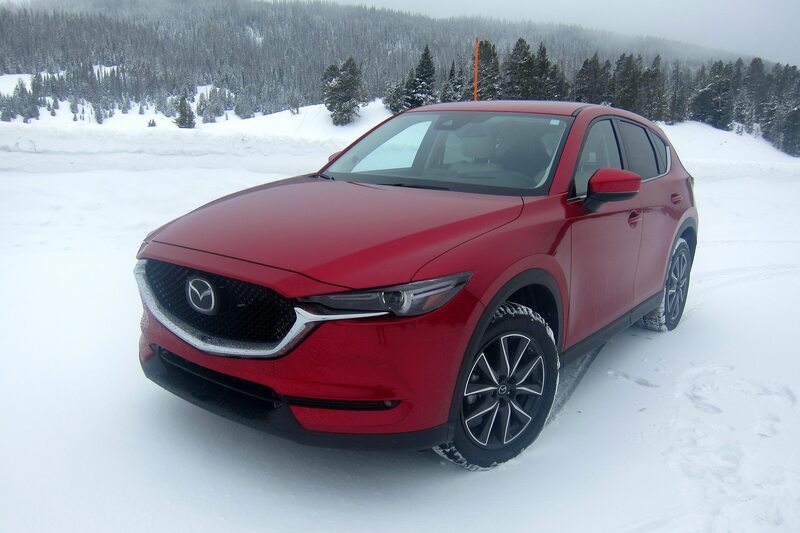 The Mazda CX-5’s AWD worked fine, as far as I could tell. Just as with the mountain roads around Jackson Hole, Wyoming, the Predictive i-Active AWD worked well by not letting itself be known, and I had no deep snow from which to extricate myself. The height of the SUV did nothing special for me, and frankly, I would have preferred a car’s lower center of gravity under these conditions. 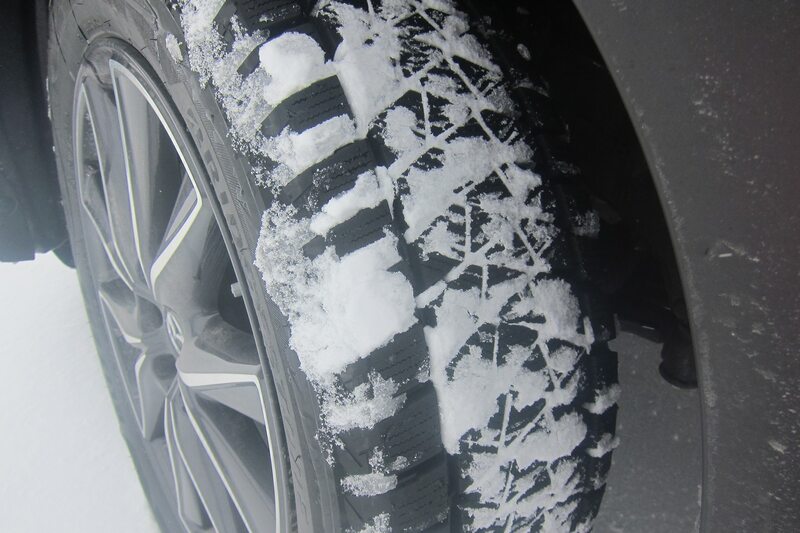 It’s the Bridgestone Blizzaks that gave me confidence in the SUV’s ability to hold the road in the slipperiest of conditions. 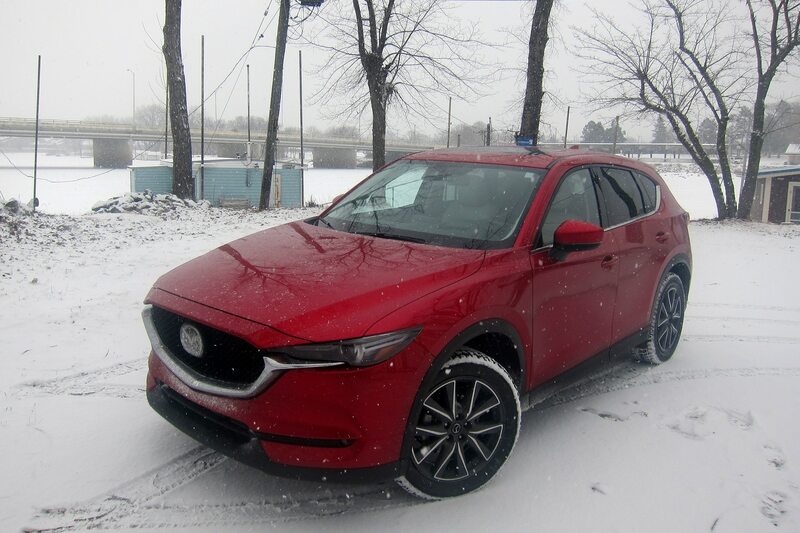 I reached Metro Detroit late, right about halftime for Super Bowl LII, impressed by one important quality found in the Mazda CX-5: its ride-and-handling balance, which is that of a comfortable, tight-handling sport/utility that would make a more expensive nameplate proud.